The Vizsla (English pronunciation: /ˈviːʃlə/ veesh-lə, Hungarian: [ˈviʒlɒ]; English plural: Vizslas Hungarian plural: vizslák) is a dog breed originating in Hungary. The Hungarian or Magyar Vizsla are sporting dogs and loyal companions, in addition to being the smallest of the all-round pointer-retriever breeds. The Vizsla's medium size is one of the breed's most appealing characteristics as a hunter of fowl and upland game, and through the centuries the Vizsla has held a unique position for a sporting dog – that of household companion and family dog. Profile of a 5-month-old Vizsla with the AKC standard "golden rust" coat. Various breeds are often mistaken for Vizslas, and Vizslas are often mistaken for other breeds. Redbone Coonhounds, Weimaraners and Rhodesian Ridgebacks are some of the most commonly confused breeds. The body structure of a Vizsla is very similar in appearance to a Weimaraner and Redbone Coonhound, though the Vizsla is typically leaner with more defined musculature. Weimaraners and Rhodesian Ridgebacks are larger than Vizslas. 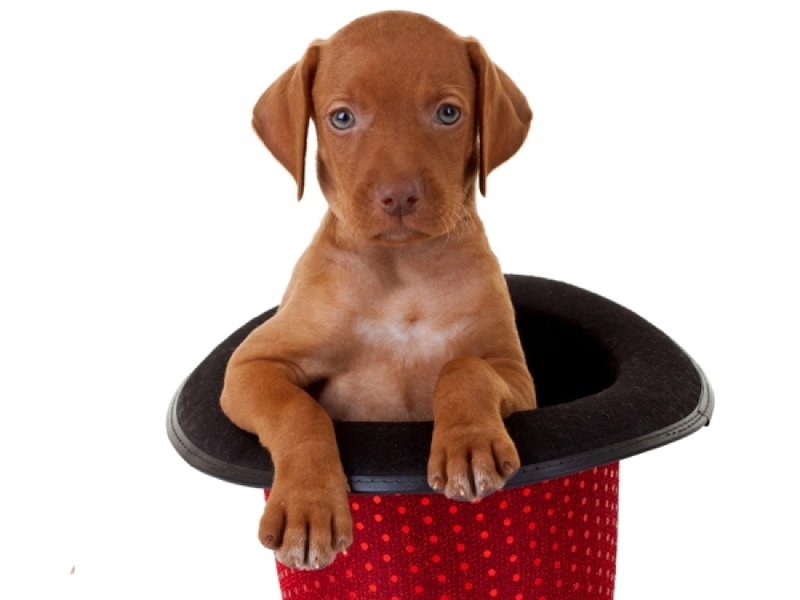 The nose of the Vizsla will always have a reddish color that blends with the coat color. Black, brown, light pink, or another color nose is an indication of another breed - or at least not a pure Vizsla. Eyes and nails should also blend with coat color. An adult Vizsla with a solid rust coat but without desired square muzzle. The standard coat is a solid golden-rust color in different shadings, but some breeding programs have resulted in a solid rust coat. The coat could also be described as a copper/brown color, russet gold and dark sandy gold. Solid dark mahogany red and pale yellow are faulty. Small areas of white on the fore-chest and on the neck and pie. permissible but not preferred. Some variations in the Vizsla coat color along their back (saddle-type marks) is typical. The American Kennel Club (AKC) breed standard for the Vizsla states that the coat should be short, smooth, dense and close-lying, without woolly undercoat. The Vizsla is totally unsuited to being kept outside, since unlike most other breeds, it does not have an undercoat. This lack of undercoat makes the Vizsla susceptible to the cold so it must not be kept in a kennel or left outside for extended periods of time. They are self-cleaning dogs and only need to be bathed infrequently, and are somewhat unique in that they have little noticeable "dog smell" detectable by humans. After several forays into lakes and streams they will develop an aroma that is a weaker version of the 'wet dog' smell. A quick bath and this odor will vanish. The American breed standard calls for the tail to be docked to two-thirds of its original length. Breed standards in countries where docking is banned do not require this (UK breed standard, for example). The Vizsla holds its tail horizontal to the ground and wags it vigorously while charging through rough scrub and undergrowth. Without docking, the unprotected tip can suffer splitting and bleeding. Once damaged, the tail is extremely difficult to heal, sometimes requiring amputation later in life where the dog must be placed under general anaesthetic causing undue stress and pain. In the Royal School of Edinburgh small animal practise, out of 12,000 dogs registered, only 47 cases were attending due to tail injuries. In Australia out of 2000 dogs attending an animal emergency clinic only 3 were there because of tail damage. Defra's Animal Welfare Veterinary Team reviewed tail docking to prevent injury in 2002. They pointed out that basic first aid would treat most cases of tail injuries. This hardly equates to it being an adequate reason to dock a working dog's tail especially as Defra also reported that: "True working animals constitute only a very small portion of dogs within the UK." The Defra Animal Welfare Veterinary Team also showed more inconsistencies that prove docking; "working dogs" is carried out for cosmetic reasons and tradition rather than to prevent injury. The most obvious inconsistency to the pro-docking argument is that Foxhounds and Sheepdogs (Border Collie) are in fact the most common working dogs and these dogs spend their lives working in scrubland and rough vegetation and through woodlands yet are not docked. There is also no evidence to show that these dogs suffer from excessive tail injuries. Then one must consider the plight of the fox that seems to manage to move through dense undergrowth at speed and with ease yet it sports a delightfully bushy tail! The docked tail of the Vizsla is significantly longer than that of other dogs with traditionally docked tails such as the Weimaraner, Doberman, Boxer, and Australian Shepherd. Since the tail is docked when the puppy is less than three days old, this longer dock can result in some variation in tail length among Vizsla dogs from different breeding programs. Good example of the AKC breed standard "golden rust" coat, here with quarry. Vizslas are very high energy, gentle-mannered, loyal, caring, and highly affectionate. They quickly form close bonds with their owners, including children. Often they are referred to as "velcro" dogs because of their loyalty and affection. They are quiet dogs, only barking if necessary or provoked. Sometimes when these dogs feel neglected or want something, they will cry. They are natural hunters with an excellent ability to take training. Not only are they great pointers, but they are excellent retrievers as well. They will retrieve on land and in the water, making the most of their natural instincts. However, they must be trained gently and without harsh commands or strong physical correction, as they have sensitive temperaments and can be easily damaged if trained too harshly. Vizslas are excellent swimmers. Like all gun dogs, Vizslas require a good deal of exercise to remain healthy and happy. Vizslas can also suffer from hypothyroidism, dwarfism, persistent right aortic arch, tricuspid valve dysplasia, and progressive retinal atrophy. Major risks include epilepsy and lymphosarcoma. Vizslas can also be prone to skin and food allergies. Companion dogs of the early warlords and barons, Vizsla blood was preserved pure for centuries by the land-owning aristocracy who guarded them jealously and continued to develop the hunting ability of these "yellow-pointers". Records of letters and writings show the high esteem in which the Vizsla was held. The Vizsla survived the Turkish occupation (1526–1696), the Hungarian Revolution (1848–49), World War I, World War II and the Russian Occupation. However, Vizslas faced and survived several near-extinctions in their history, including being overrun by English Pointers and German Shorthair Pointers in the 1800s (Boggs, 2000:19) and again to near-extinction after World War II. A careful search of Hungary and a poll of Hungarian sportsmen revealed only about a dozen Vizslas of the true type still alive in the country. From that minimum stock, the breed rose to prominence once again. The various "strains" of the Vizsla have become somewhat distinctive as individuals bred stock that suited their hunting style. Outside Hungary, vizslas are commonly bred in Romania, Austria, Slovakia, and Serbia. The Vizsla started arriving in the United States at the close of World War II. As interest in and devotion to the breed began to increase, owners formed the Vizsla Club of America in order to gain AKC recognition. As a result of registering foundation stock with the AKC, Vizsla owners were able to obtain official recognition on November 25, 1960, as the Vizsla became the 115th breed recognized by the American Kennel Club. The Vizsla was used in development of other breeds, most notably the Weimaraner, Wire-haired Vizsla and German Shorthair Pointer breeds. There is much conjecture about those same breeds, along with other pointer breeds, being used to reestablish the Vizsla breed at the end of 19th century. In either case the striking resemblance among the three breeds is indisputable. Approximately 1,000 Vizsla puppies are registered with the Kennel Club of Great Britain (KC) each year, making the breed one of the top 50 most popular. The number is steadily rising year on year as more people recognise the breed. At least two breed clubs for the Vizsla exist in Britain. The winner of the Best In Show award at Crufts 2010 was a Vizsla named Hungargunn Bear It'n Mind. Frank J. Tallman and Emmett A. Scanlan imported Vizsla Sari as the first Vizsla in the United States of America. Sari and her two pups (Tito and Shasta) were delivered by a TWA cargo plane to Kansas City via New York from Rome on October 7, 1950. Sari was later bred with Vizsla Rex. The male Vizsla Rex del Gelsimino, born 8/1/49, was purchased for $75 in food, clothing, medicine, and other supplies thanks to Belgrade's US Embassy employee M.M. Yevdjovich who provided the direct connection to the owner in Stapar, Serbia to Tallman's representative Harry R. Stritman. Rex understood German and Hungarian commands and the claim has been made of history dating back to 1730 although never verified through a Serbian dog book in Yugoslavia. Rex was delivered by a TWA cargo plane to Kansas City via New York via Brussels from Belgrade on June 12, 1951. The American Kennel Club recognized Vizsla as the 115th breed on November 25, 1960. Che the family dog from The Goode Family is a Vizsla. Canadian DJ/producer, Tiga used to have a female vizsla, called Uma. She's been portrayed on the cover art of the vinyl edition of Tiga's DJ-Kicks compilation album as conveniently stretching out on a sofa. Gary Dell'Abate, also known as Baba Booey from The Howard Stern Show has a Vizsla named "Murphy".